Discover New York by hop-on, hop-off bus and ferry that’s valid for 48 hours! A free night tour is included in this package! Discover the magnificent city of New York from an open-top bus, ferry and from America’s tallest skyscraper! This super-saver combo package offers 48 hours of marathon sightseeing with a hop-on, hop-off bus ticket, a hop-on, hop-off ferry tour and admission to One World Observatory which offers sweeping views of New York’s skyline and beyond. Enjoy a highly flexible New York sightseeing tour where you can hop on and hop off the bus or ferry at all your favourite attractions and see the Big Apple in your own time! 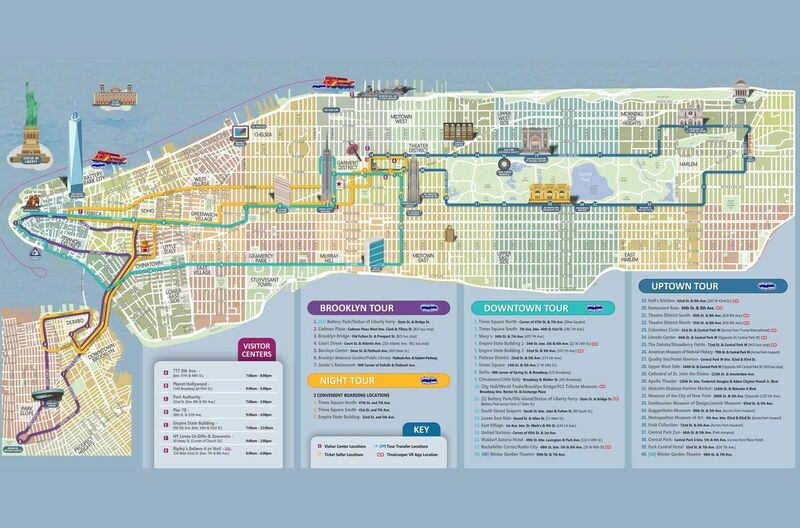 The hop-on, hop off bus has four routes, namely the Downtown, Uptown, and Brooklyn Tour. With more than 50 stops covered by these routes, all the major city highlights are covered. See New York from the 102nd floor of the One World Observatory. With its 360-degree views, three levels of innovation and immersive exhibits - the One World Observatory is an absolute must-visit when in New York! Also included in this amazing package is a free night tour, entrance to the Museum of the City of New York or the New York Historical Society and an Eat and Play Discount Card for amazing deals on shopping and restaurants! Ticket is valid for 48 hours from the time of issue. Hop-On, Hop-Off Tour: Vouchers must be exchanged theGray Line CitySightseeing New York Visitor Centre at 777 8th Avenue, between 47th and 48th Streets. Once you have exchanged your voucher at the Gray Line CitySightseeing New York Visitor Centre, you can board the double-decker bus from any of the stops. One World Observatory : One World Trade Center, 285 Fulton Street, New York, New York, 10007. Enter on West Street at Corner of Vesey Street. This great value package will show you the very best of New York City. Explore at your own pace with the New York hop-on, hop-off tour on 4 different routes. Take a guided tour of New York by night. Take a Hop-on, Hop-off Ferry, visit the Museum of the City of New York or New York Historical Society Museum and visit One World Observatory. Admire stunning views of the skyline from the top of the tallest building in the Western Hemisphere. Enjoy an innovative & interactive experience at the new One World Observatory attraction with entrance included in this package. Live Commentary in English on Double-Decker buses. Voucher Information: Sorry, but we will need you to print a paper version of your booking voucher (we're working on changing this ). At this time no refund can be given for customers without a printed copy of their voucher. Immediately on booking you will be emailed a receipt for your One World Observatory Tickets. Your barcoded e-ticket will be sent by email within 24 hours of booking. This ticket can be shown on your smartphone to enter the attraction.